Motoreducers are designed for driving machinery and equipment. They are adapted for operation under marine climate conditions. They can be installed in closed compartments and on weather decks. Motoredusers are provided for horizontal operation but their construction enables operation at the heel up to 30° in any direction. Motoreducers constitute a set of gear and three-phase asynchronous motor. 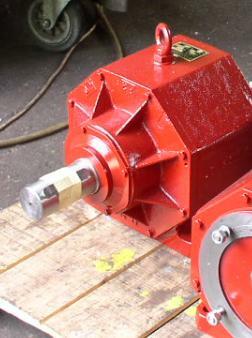 In typical versions, splash-proof motors are used. Motoreducers are supplied with 3x380 V, 50 Hz. Motoreducer constructions are dust- and water-proof. They can be mounted on lugs or by means of flanges. third number of digital designation (112 M-4, 100L-4A, 100L-4B, 90L-4, 90S-4, 80-4B, 80-4A ) designates size of electric motor.